Enjoy Toledo afternoon tour and combine it with a flamenco show by night in Madrid. 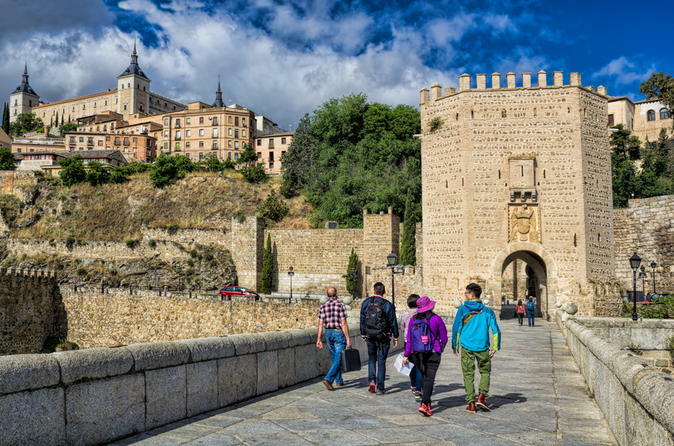 Upon arrival to Toledo you'll begin with walking tour, entering to the old quarters to visit the Plaza del Ayuntamiento, and admiring the facade of the impressive Primate Cathedral, the old Palace of Justice and the City Hall. Continue your walk through the old Jewish quarter with its narrow streets, and visit the Church of St. Tomé, with the very famous painting of El Greco “The Burial of Count Orgaz.” Visit the old Synagogue of Ste. Maria la Blanca, which remains as a symbol of the coexistence of the “Three Cultures”. You’ll also visit a typical workshop of Damasquino, a well known handicraft art of Toledo. Return back to Madrid, to enjoy the Tablao Flamenco Torres Bermejas. Opening in 1960, Tablao Flamenco Torres Bermejas has become one of the most popular flamenco shows in the world . Unique for its stunning room that reproduces inside the Bermejas towers of the Alhambra in Granada, walls with Arabic motifs, tiles and wooden coffered ceilings, and home of the most famous Flamenco singers and dancers. Experience the ambience and see a magnificent show of Flamenco songs and dances, including a complimentary drink.